Guys its time to give up, LOOK what Fizz just told me? So all of a sudden because they are telling you the truth, your deciding to give up on Fizz? You asked them a question and that is the answer, you must have been expecting this answer since shortcodes have been an issue since square one of the release of Fizz to the public. 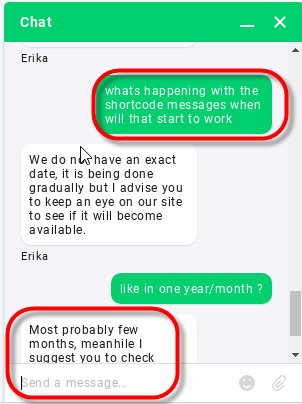 I understand it may be frustrating but when you signed up, you acknowledged that there would be shortcode issues, it's written in plain sight. I do understand from your point of view that it may seem hopeless, but if you aren't happy with the service you are getting right now, then use another provider for the time being then you can come back later. My intention in writing this wasn't to be rude. Just to point out a few facts since there has been alot going on regarding shortcodes lately. Not end of world. Speakout sim can receive short code and it's $2/month. @Tom K., I have Speakout also, do u know if 2FA works on Speakout? I have limited knowlege in mobile, not sure if Short Code is same as the famous 2FA. Thanks in advance! And I was told "a couple of weeks" by Andrei on Facebook messenger (see printscreen). I don't think their Frontline staff have any idea how long it will take, nor much of what the technical staff are doing behind the scenes. @V C. , yes it works with short codes. Everything of Speakout need pay including 911 fee. I do know it works because Speakout number was with my apple id, and my gmail. Both Apple and gmail work with speakout. Mobile is up again, but you most likely already know. Please close this post by clicking on the button Make this a best answer?